UK-based LivaNova has secured approval from the US Food and Drug Administration (FDA) for its next-generation Vagus nerve stimulation (VNS) therapy for the treatment of epilepsy. The latest VNS system features SenTiva implantable generator and the next-generation VNS therapy programming system to treat patients with drug-resistant epilepsy. LivaNova’s VNS therapy programming system includes wireless wand and new user interface on a small tablet. SenTiva is claimed to be the epilepsy device of its size to include detect and respond mode to avoid seizures before they start and automatically deliver extra therapy to stop them if they occur. The device also collects and logs events commonly associated with seizures such as patient's body position and heart rate variations. 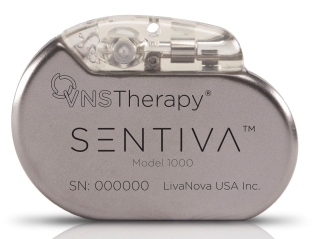 The VNS therapy programming system is compatible with all LivaNova VNS therapy generators, in addition to SenTiva. LivaNova North America president and neuromodulation business franchise general manager Jason Richey said: "We created SenTiva and the accompanying VNS Therapy Programming System based on feedback received from patients and physicians to ensure ease of use, better patient care and cost effectiveness. Based in London, LivaNova operates three business units, including cardiac surgery, neuromodulation and cardiac rhythm management. Image: SenTiva is the smallest and lightest responsive therapy for drug-resistant epilepsy. Photo: courtesy of Business Wire.